Dorset’s first ‘Bikerdown!’ safety initiative event has taken place at the Safewise Centre in Bournemouth. Hosted in partnership with the Docbike Project, Dorset and Somerset Air Ambulance, Dorset Police and proudly sponsored by Bournemouth Bikes, the fully booked event saw Dr Ian Mew (Dorset Police Medical Advisor and Air Ambulance Trauma Doctor) and PC Chris Smith (Dorset Police Bikesafe Co-ordinator) deliver a three hour engaging seminar, free of charge. 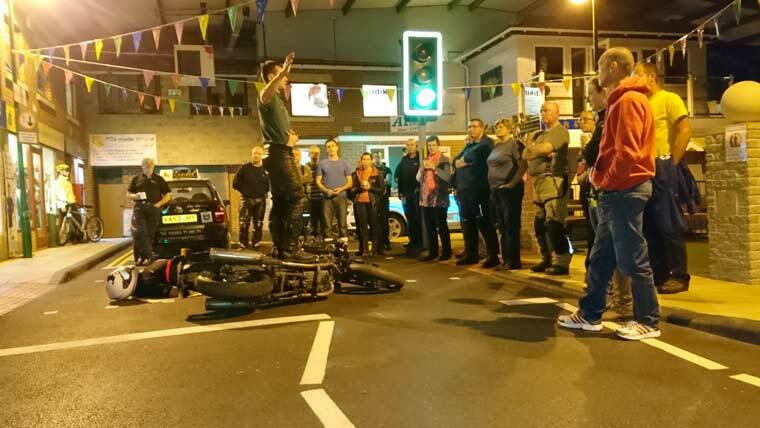 The duo educated riders on what to do the moment a motorcycle incident occurs including safely securing the scene, making sure an ambulance is called, treating a casualty and the controversial subject of how to safely remove a motorcycle helmet. The event concluded with a talk about the ‘science of being seen’ where PC Smith explored the effectiveness of Hi-Viz, how best to use it and other factors including ‘motion camouflage’, ‘looming’ and tips on how riders can best be seen without wearing bright fluorescent pink from head to toe. Feedback from the event was excellent. Students said that they would recommend the event to their fellow riders and friends and subsequently would now have the confidence and knowledge to step forward and potentially make that life-saving difference following an incident. Those who attended received a free first aid kit, designed to be stored on a motorcycle, thanks to ‘Bikerdown!’ sponsors Bournemouth Bikes. Two more events are planned for 2016 which take place on: Tuesday 1 November and Tuesday 13 December. More information about the ‘Bikerdown!’ course and the Docbike Project can be found at the Docbike website www.docbike.org.